In proportion as our inward life fails, we go more constantly and desperately to the post office. You may depend on it, that poor fellow who walks away with the greatest number of letters, proud of his extensive correspondence, has not heard from himself this long while. Pride flees from the man who penetrates into the self as the light of a campfire before the rays of the sun. You should know that no one can hold the mind by himself, if it not be held by the Spirit. For it cannot be held, not because of its mobile nature but because, through neglect, it has acquired the habit of turning and wandering hither and thither....A mind thus inclined and withdrawn from God is led captive everywhere. 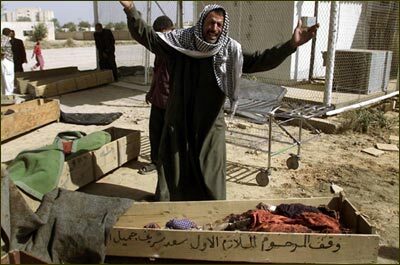 How many civilians, the elderly, women, children, male noncombatants, have died in the War on Iraq? It used to be that a casualty count was important in warfare. It's how you knew you were winning. Of course that's when soldiers would gather on a field of battle, face each other, march up with some fancy footwork and football plays, and shoot it out. Civilians got killed in the seige of a castle or city...or mass execution later...but it's been fewer than a hundred years of glorious history since we've improved ourselves enough to provide access to air attack. To begin the generals played by the old rules, lobbing bombs onto troop locations, splattering civilians only by accident. But then, maybe troops started hiding behind the lady's skirts, so the only thing to do was aim at buildings and homes. This activity required a new kind of behavior and discipline from the average pilot...and I imagine it still does the first time a pilot is ordered to shoot a rocket where there might be babies. But it looks as though humans can get used to anything...and of course duty calls. At first, the firebombing campaign against Dresden by the team of the USAAF Eighth Air Force and RAF Bomber Command in 1944 and 1945 wasn't talked about much. So many tens of thousands of people were killed and almost the entire city flattened by tens of thousands of tons of high-explosive bombs and incendiaries that folks had trouble even thinking about it. [link] Possibly Kurt Vonnegut, who experienced the February 1945 attack as a prisoner of war and survived, is more responsible than our history teachers for making us remember that it happened at all. Besides, when we almost immediately went on to drop atomic bombs on Hiroshima and Nagasaki, the business at Dresden seemed like small potatoes. At least 120,000 people were killed immediately, almost 95% of them civilian. Nearly twice that number have died since from their injuries and radiation. [link] Obviously the Japanese army wasn't hiding in schools and hospitals in those cities. This was a preventive attack, an object lesson, a morality tale. The Allies were the Good Guys, and here was the proof. No, I'm not arguing anything in favor of the Nazi Axis, but I do call into question the sense of superiority that particularly the United States assumed 60 years ago and has labored on ever since. We've never been really proud of Hiroshima and Nagasaki, but I don't think we apologized either, did we? In the Orient official apologies from one nation to another are highly honored. Generally I think Americans feel it was horrible to do it, but it had to be done. This is how war goes. We've never thought of ourselves as war criminals in any sense. We expect our own court martials to take care of perpetrators of massacres a la Viet Nam. We know that people freak out in war, and now with television and instant computer communication we know such things occur more than we used to. Which brings us to Shock And Awe. Here we were going after one man who might be in Baghdad. The whole strategy was planned out with pinpoint accuracy. [link] How many civilians died during the display...and after? General Tommy Franks, of the US Central Command, replied, "We don't do body counts." [link] Why not? What happened to the tally that tells us whether or not we're winning? Are we ashamed? Don't we want anyone to know? Is this the way our leaders hide behind the lady's skirts these days? We just don't talk about it? We aren't allowed to think about it? How many women and children and elderly have died in Iraq? This past weekend the generally excellent PRI show "This American Life" featured a Johns Hopkins survey done in Iraq and published an entire year ago that attempted to answer that question. You can hear the show here [link] and you can read the survey after you register (quick and free) at the distinguished British journal The Lancet [link] . The estimate then---over a year ago---was 100,000 people. The method of the survey generally has been applauded by major scholars everywhere who keep up with those kinds of investigations and statistics. The guys from Johns Hopkins who conducted it were lucky to get in and get out alive. What Ira Glass was wondering during his broadcast is how come no one heard about this study? The authors thought their results would be all over the media...and they even confess to having expected moral outrage. But almost nobody carried the release and results at all. I wonder why. Do you think there's a conspiracy of publishers to keep news from us? Are we all too confused and numb to deal with our own consequences? Has the United States come to a point where its population just can't handle it? How dangerous would be such a state of mind? What does it take to drive an Iraqi son, husband, and father insane with grief? What would it take to make you that way? but I'm sure it was carried in the broadsheets here (UK).......at least the figure of 100,000 was broadly quoted. Not, I'm afraid that it can make much difference now. We (albeit against the will of many of us) have made this mess and there's no easy, just-add-water solution to clearing it up. Alyssa Bernstein is just one of many new friends discovered during last year's political campaigns. She's Assistant Professor of Philosophy at Ohio University http://www.philosophy.ohiou.edu/bernstein.htm with a special interest in human rights. Her view sums up the war in Iraq as succinctly as any I've seen: "The aim of democratizing a country... is not a morally acceptable justifying reason for using military force against it." http://ethics.sdsu.edu/conference/Bernstein.htm There's a nice picture of her here http://www.ksg.harvard.edu/cchrp/fellows0001.shtml a couple years ago as she received her Phd. (She's blushing now as she realizes how much Google has on her already.) Anyway, Alyssa's concerns always are serious...and this message she's asked me to forward deserves your urgent attention. Thanks again for your mailings. Here is something I'd like you to distribute to your mailing list, please. Bingaman's amendment to Graham's amendment to S. 1042. Thanks to everyone who calls. Prayer vigils are being held around the world today for the members of the Christian Peacemaker Teams, kidnapped almost 2 weeks ago in Iraq by the Swords of the Righteous Brigade and threatened with execution by them tomorrow. There is not much coverage about the situation in the US, as our Secretary of State continues her tour of Europe. The Toronto Star reports this morning at least one concerned man is on his way to Baghdad to plead openly for them---in Arabic http://www.thestar.com/NASApp/cs/ContentServer?pagename=thestar/Layout/Article_Type1&c=Article&cid=1133910614448&call_pageid=968332188492&col=968793972154 , but perhaps most of us feel helpless, numb, or don't want to think about it. Kidnappers extended a deadline Wednesday for the threatened killing of four captive peace activists and posted a video of two of the hostages wearing robes and shackled with chains. The original deadline set by the group calling itself the Swords of Righteousness was Thursday. Al-Jazeera said it was extended until Saturday. Norman Kember, 74, of London, Tom Fox, 54, of Clear Brook, Va., and the Canadians James Loney, 41, and Harmeet Singh Sooden, 32, were taken hostage in Baghdad two weeks ago. They were working for the Christian Peacemaker Teams, an anti-war group. The four Christian peace activists are among seven Westerners who have been abducted in Iraq since Nov. 26. Others include another American, a German and a Frenchman.